The Port Isabel Lighthouse dates back to before the Civil War. For generations, the Port Isabel Lighthouse has stood as an icon of safety, strength and stability. Not even hurricanes and wars have wrecked the whitewashed tower, built of bricks. So what better place to start a new marriage? That’s what Carrie and Aaron Reed did. 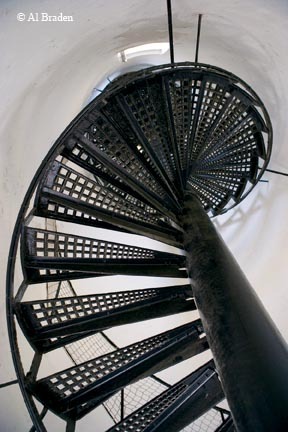 In October 2009, the Dallas couple climbed a spiral staircase and three ladders to reach the lighthouse’s lantern room, where they exchanged vows, rings and a big smooch. “We love everything the lighthouse symbolizes,” Carrie says more than a year later. “We also connect with how it draws people and inspires a lot of happiness,” she adds. Fun, too. Like many kids who visit, Carrie — the evening before her wedding — couldn’t resist tumbling down the lighthouse’s grassy knoll, where families often picnic, play and relax. Of the state’s five surviving lighthouses, only Port Isabel’s welcomes visitors. Completed in 1853, the conical structure — which stands on a bluff overlooking the seaport — is near the sites of the Civil War battle of Palmito Ranch and the Mexican War battles of Palo Alto and Resaca de la Palma. During the Civil War, both sides used the tower as a lookout post. Miraculously, two attempts by Confederate troops to blow up the lighthouse failed. With the advent of railroads, commerce in the harbor declined. Underfunded and hardly needed, the lighthouse was darkened in 1905. In 1933, the structure withstood a hurricane, unnamed but one of the worst Port Isabel has ever had. After years of neglect and indecision about its future, the lighthouse became a state park in 1952. In 1996, the city of Port Isabel took over operations of the site, which is still owned by the Texas Parks and Wildlife Department. In 2000, a second restoration was completed. Today, tourists can trek up 76 steps to the lighthouse’s two observation levels — the outside deck and lantern room. Both offer panoramic views of the city, South Padre Island, the Queen Isabella Memorial Bridge and the Laguna Madre. Visitors can also tour the Keeper’s Cottage, a replica of the lighthouse keeper’s original home. The white clapboard house contains interpretive exhibits and the offices of the Port Isabel Chamber of Commerce. The Port Isabel Lighthouse State Historic Site is located in Port Isabel, approximately 26 miles east of U.S. 77/83 on Texas Highway 100. Tours are given daily. Admission is charged. For more information, call the Museums of Port Isabel at 956-943-7602 or visit www.tpwd.state.tx.us/portisabellighthouse..